With February being commonly known as the month of love The Midweek Sun caught up with an elderly couple which has been married for 42 years this past weekend. Despite Botswana’s escalating divorce cases, the Kanye couple has defied all odds and stayed in marriage for four decades. 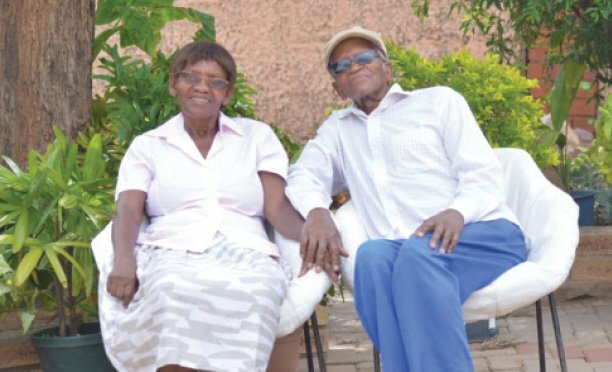 The 80-year-old Lotshwao Mark Yane and 68-year-old Kesentseng Yane married in 1976 in Gaborone. “We both entered into this matrimonial union with nothing, we had no property. And it is not like we were earning much where we worked,” said Lotshwao. He said that by the time he decided to marry, he was a doctor at Athlone Hospital in Lobatse and his wife worked as a nurse in Gaborone. “For a couple to stay long in marriage, they should always travel together and do basic chores together. I never leave my wife behind,” he said, while holding his wife’s hand.According to Lotshwao, among the many reasons, a lot of marriages fail in situations where a wife earns more than the husband, but said regardless of such situations marriage should be respected. “I know that usually women who earn more than their husbands tend to disrespect them. Whether rich or poor, there has to be mutual respect in marriage,” advised Lotshwao. He added that they married a long time ago when it was still a norm that a man proposes to a woman, not the other way round. Lotshwao also advised husbands to care for their wives, saying that he used to give all his salary to his wife, who would then divide it accordingly. Explaining how they managed to sustain their marriage, Lotshwao’s wife Kesentseng revealed that sometimes her husband cooks and cleans for her. “We are loyal to God and he has been our pillar in this marriage. I advise all married couples to believe in God as well,” she said. The elderly couple has two grown children and they are now living with their grandchildren in Kanye at Ntsweng ward, but Kesentseng hails from Molepolole in Kweneng district.